The distinctive and beautiful barn owl is one of the birds of prey that is most adapted to life near humans. Unlike many hawks and other predators, barn owls are often encouraged to nest on farms and near other developed areas because they prey almost exclusively on mice and other small rodents. This makes these nocturnal birds excellent for pest control without the need for expensive chemicals or other, less environmentally-friendly methods. Markings: Genders are similar though females are typically larger. These owls have a white, heart-shaped facial disc surrounded by a narrow white or golden brown rim. The head, nape of neck, back, and wings are golden brown while the chest and abdomen are white or pale with faint black or gray spots. Long legs are covered with fine white feathers, and the wings and tail have dark barring. Eyes are dark. It must be noted that there are many color variations among barn owls, and some regional subspecies may seem much lighter or darker than typical. Sizes also vary greatly, though the barn owls of North America are among the largest. Barn owls are the most common owl species in the world and can be found on every continent except Antarctica, though they are scarce in many areas. 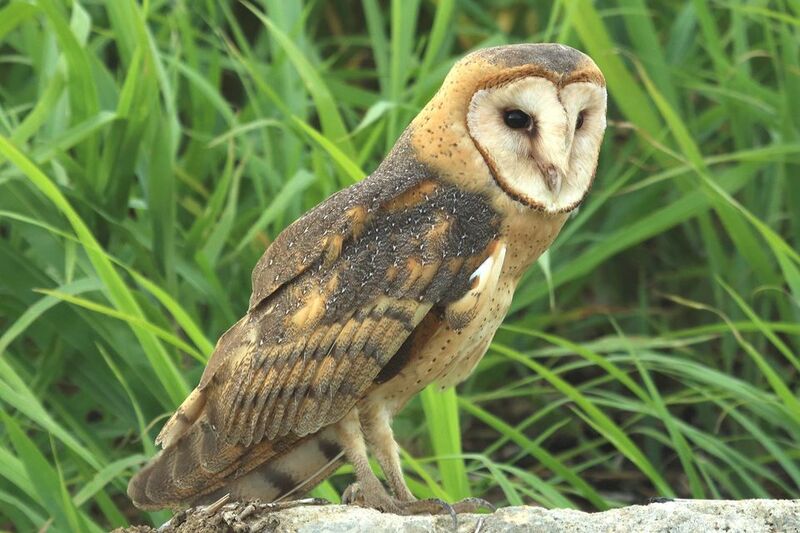 In North America, barn owls prefer open grassland and meadow habitats or sparsely forested areas, including marshes and agricultural regions as well as urban and suburban areas. In the Midwest, barn owls are locally endangered in several states. Populations in the northern Great Plains region may migrate seasonally. Barn owls can be noisy birds, particularly as nestlings. Common calls include a rasping, extended hiss when threatened or angry and a high screech that cuts off abruptly at the end. Other sounds include beak snaps and tongue clicks. Like all owls, the flight of barn owls is largely silent and no distinct wing beats are heard, despite the large size of the owl's wings. Barn owls are primarily nocturnal hunters and are rarely seen during the day, though they may be spotted in the early morning and late evening. During nesting season, mature barn owls that are caring for large, hungry broods may hunt even in the middle of the day. These are tactile birds that cuddle with their brood in the nest and can become very emotionally attached to their mates or wildlife handlers. Like all owls, barn owls have superb hearing and they have the best ability of all raptors to hunt by sound alone. A barn owl's flight is silent and very buoyant, and the bird's long, broad wings carry it easily. These birds may soar repeatedly over open fields as they search for prey, and will take their catch back to a convenient perch for feeding. After digesting their food, barn owls regurgitate pellets of undigested material including fur and bones. Barn owls are monogamous birds believed to mate for life. They are cavity-nesting birds, and will readily use appropriately-sized barn owl boxes or similar shelters. A pair of owls will incubate 2-3 broods of 2-18 plain white eggs each during the nesting season, and depending on the climate they can nest at any time of year. The female parent incubates the eggs for 30-33 days, and the young birds remain in the nest to be fed by both parents for 55-65 days. Barn owls readily nest in open silos, barns, and other buildings in rural areas. If no suitable buildings are available, they will investigate hollow trees and will use nest boxes. Birders hoping to attract barn owls should avoid using rodent poisons or other pest control methods that would restrict the owls’ food supply. Minimizing lights and nighttime disturbances can also help these birds feel at ease. Though barn owls are not considered endangered on a global scale, many local or regional populations of these birds can be considered threatened or endangered. The overuse of harmful rodent poisons, vehicle collisions, dangerous fences and loss of suitable nesting habitat are some of the threats to owls that are of great concern for barn owls. Northern Mockingbird - Don't Mock This Bird!